Facebook Fan Pages, and their supporting applications, are evolving fast. One of the most popular ambitions for Facebook Fan Page owners is getting their Twitter feeds integrated. A lot of people are wanting to add their Twitter updates directly to the wall streams, and you can learn how to automatically send Twitter to your Facebook Fan Page stream here. 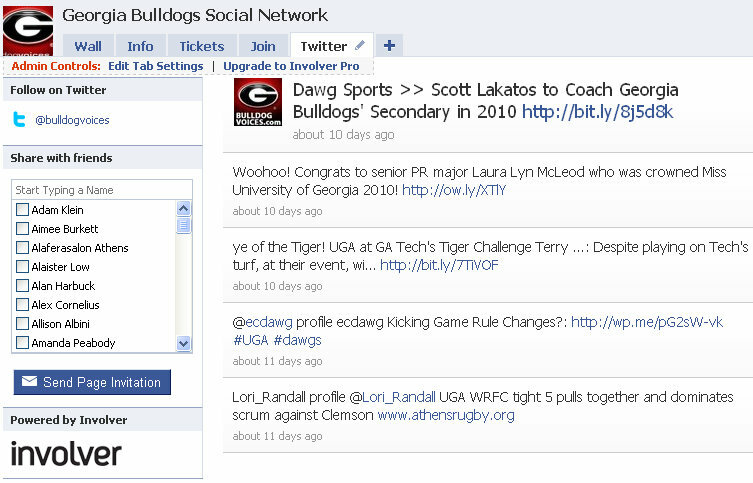 But another great way to integrate Twitter into your Facebook Fan Page is by adding a custom Twitter tab. Here’s how do it! Adding a Twitter tab is a great way to integrate your Twitter updates (tweets) into your Facebook Fan Page without clogging up your Fan Page news stream, or upsetting your fans with a bunch of tweets. As you can see, the Twitter tab fits nicely along with the other tabs along the top of your Facebook Fan Page navigation. And, it gives a great looking icon with a link pointing directly to your Twitter profile. The latest tweets are updated in the content area that make it easy for people to read, and any links that are including in the tweets are live. The application that provides this functionality is called Involver. Click here to be taken to the Involver Twitter application (make sure you are logged into your Facebook and Twitter profile). 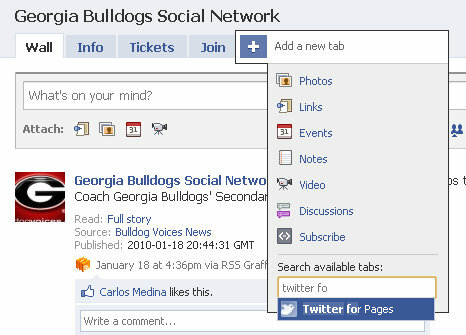 In the drop down menu, find the Facebook Fan Page that you want to add the Twitter tab to. Now you’ll be taken to an admin screen where you need to insert your Twitter profile handle (username). Just enter your username – for example, my Twitter profile is located at https://twitter.com/socialmedia_seo, so my handle (username) is “socialmedia_seo” (without quotes). After you entered your Twitter username, go ahead and click “Save Changes”. 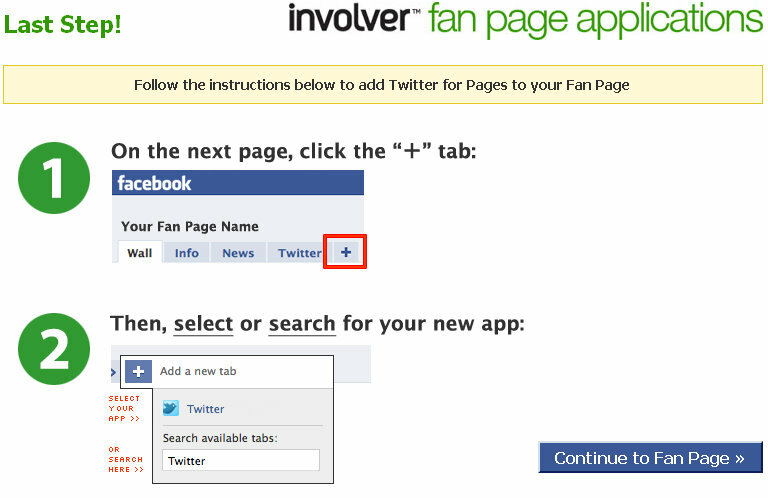 Now go ahead and click the big blue button that says “Continue to fan page”. You will then be taken to your Facebook Fan Page. After you click the plus button “+”, a drop down menu will appear. You are looking for the one called “Twitter for pages”. If you don’t see “Twitter for pages” in the drop down menu, don’t panic – it’s there, you just need to search for it. At the bottom of the drop down menu you’ll see a search bar called “Search available tabs”. Go ahead and type twitter for pages in that search bar – you should see the app you are looking for appear underneath the search bar as you are typing. So once you see the Twitter for Pages tab selection appear, just go ahead and click it and then it will automatically be added to your Facebook Fan Page tabs. And as soon as it’s added to your Facebook Fan Page tabs, it will immediately update itself and pull in your most recent tweets. You might need to hit “F5” to refresh your screen. If it doesn’t work immediately, give it a couple of minutes and you’ll soon see your Tweets, along with a great layout and design, integrated nicely into your Facebook Fan Page. Best of all, you won’t be jamming up your fan’s news stream with your tweets! I am curios: can you set it up so it will show a hashtag? It would be interesting for live tweets from an event. Thank you!